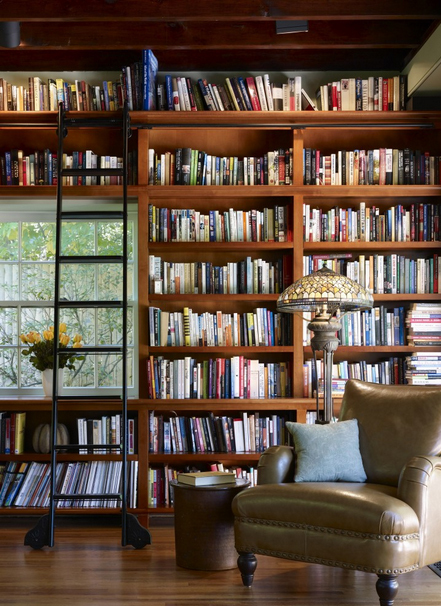 A perfect library for a Craftsman-style home. The books look well-loved, not simply smart editions, and obviously a nicely crafted room with solid shelving, wood floor, etc, and a shiny leather chair, but somehow it just doesn’t do it for me … it looks cold and slipper. A slippery floor, hard slippery chair, and a cold-to-the-touch standard lamp with Tiffany-style glass (again cold) shade. Smart, but not for me. There is a public library in Riverside, Illinois that has a reading room that looks just like this, without the ladder, including worn leather chairs. The entire town of Riverside is on the historic register. 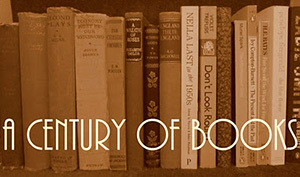 I sometimes go to the library just to sit by the fire or read in the room this post reminds me of. Lovely. I don’t do well with ladders, as I’ve mentioned before, but otherwise I do like this room. I’d add an ottoman for the chair though. Wonderful room. I looked into getting a rolling ladder like that for one wall of my books and discovered it’s pretty expensive and needs a lot of empty space at the bottom; nothing too close to the wall where I have a table. So no go. This is one I could happily live with! And the view indicates very pleasant surroundings. I love a craftsman- style house and that library looks fab.